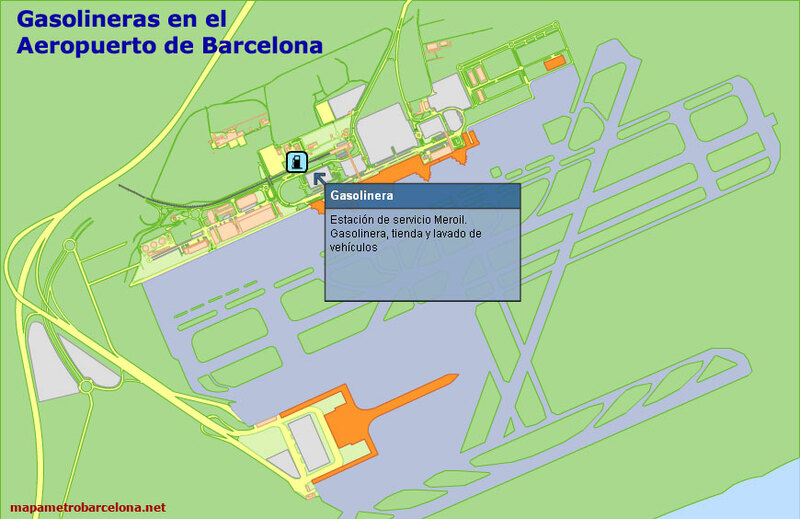 Map of Barcelona airport, location, directions, terminals, etc. 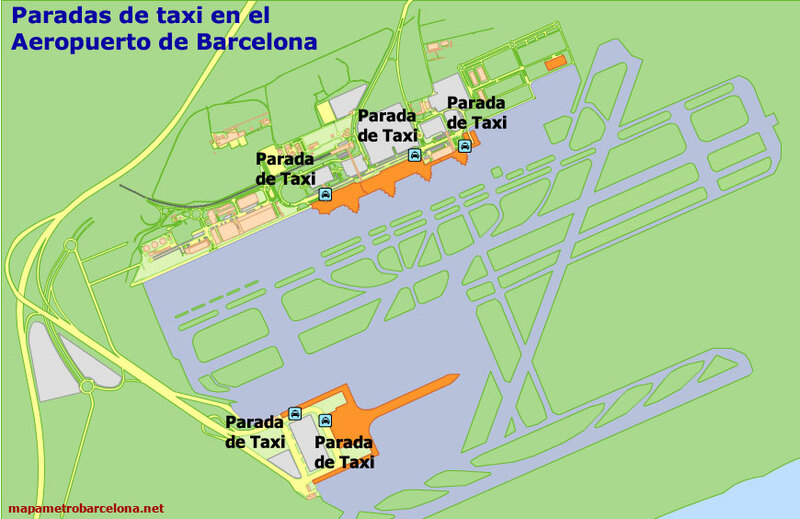 The following maps of Barcelona airport, can help to situate themselves and to choose a transport to get to the city of Barcelona. 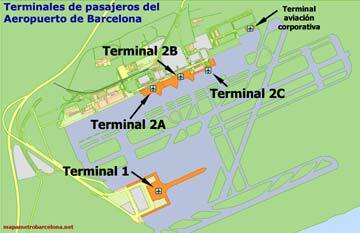 Barcelona airport is officially called "Aeroport del Prat", is 12 Km. 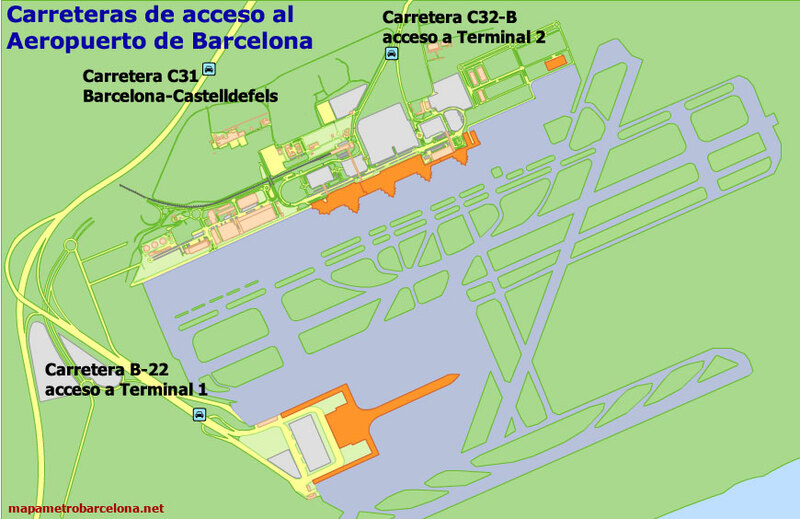 (7.45 Miles) from Barcelona and has 3 terminals. 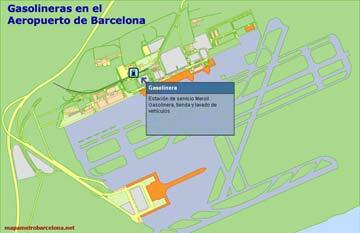 Airport Barcelona-El Prat airport is located southwest of the city, between the municipalities of El Prat de Llobregat, Sant Boi and Vilamoura. 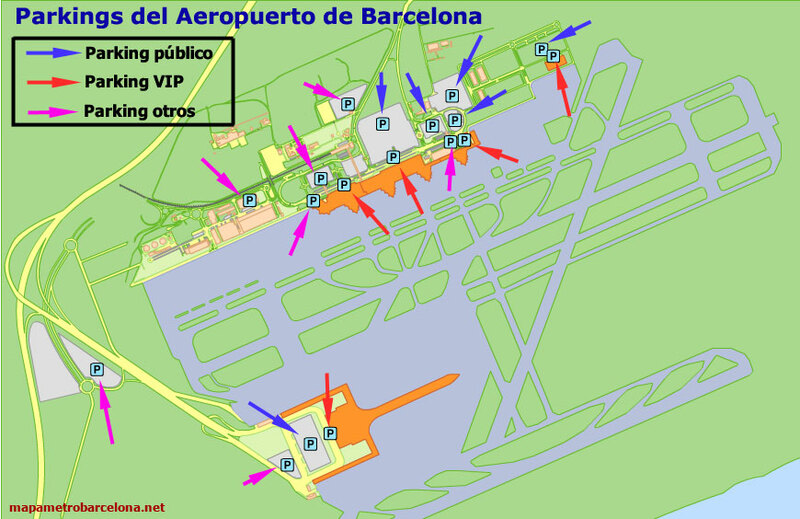 You can find information on your airline's terminal, phone or the number of appropriate airline company in this page of Aena (oficial site of Barcelona Airport). Bus. The cheapest of all transportation. Aerobus. 5,90€ the trip. See at the end of this page for more information. Metro, 9 sud line. 4,5 € the trip. Generally more comfortable than the bus. 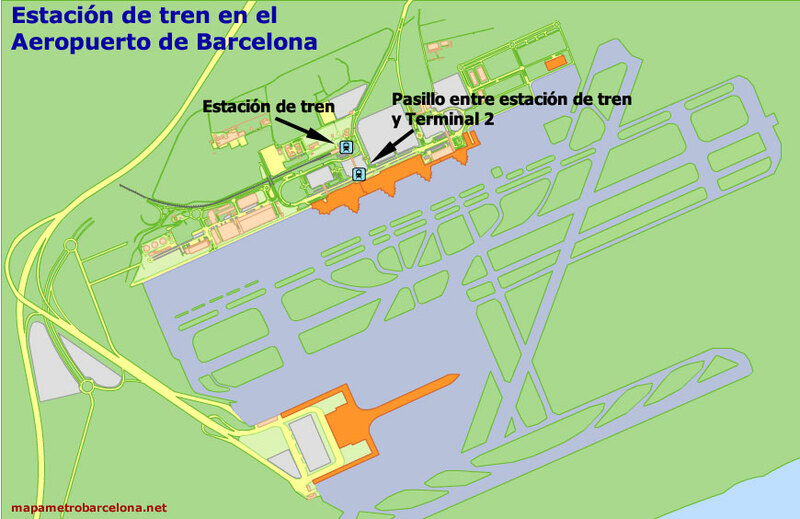 Tren. 4,5 € the trip. Generally less comfortable than the bus or metro. Car. 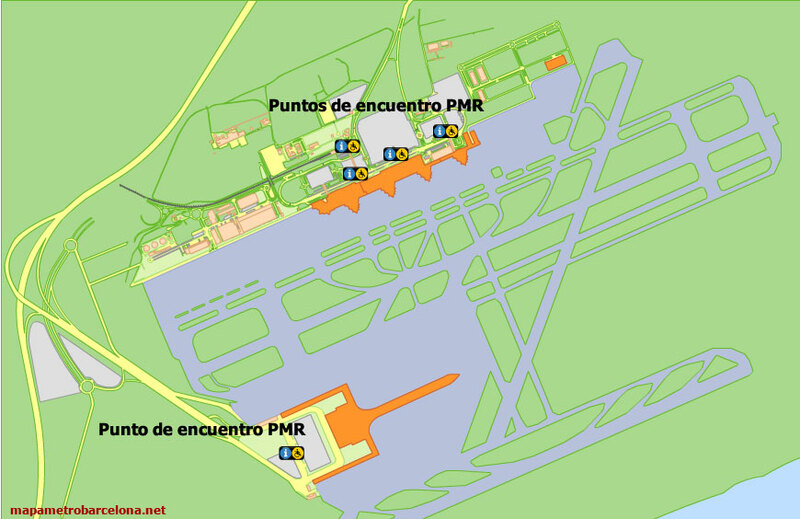 Also available Parking at terminal 1 or Terminal 2. Taxi. It can cost between 15 € and 35 € the trip, depending on whether the driver is honest or a crook, and your final place to stop. 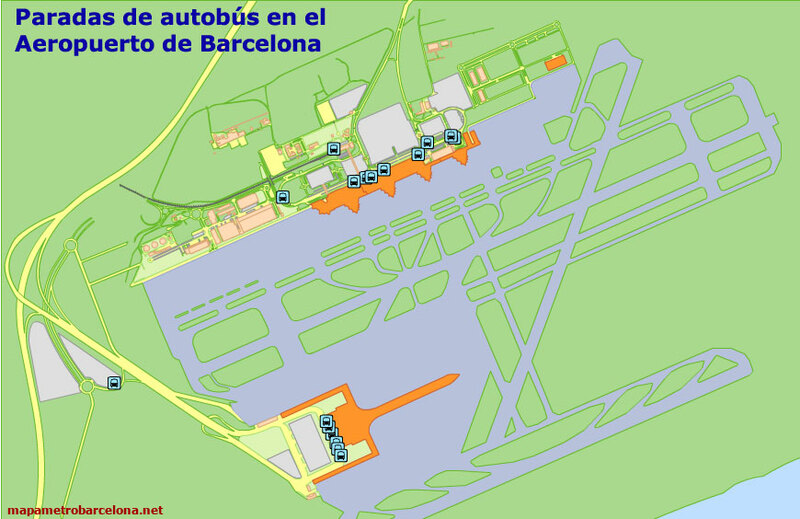 Aerobus is the bus service that connects the Airport with the centre of Barcelona leaving every 5 minutes, every day of the year. 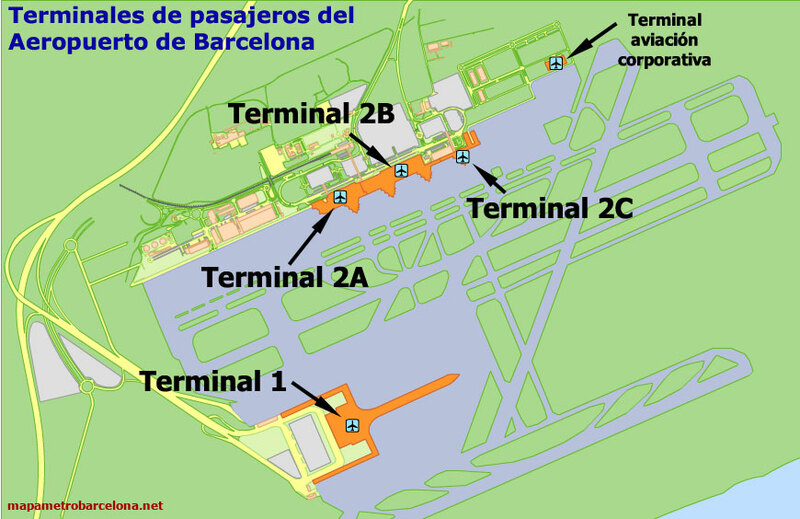 In approximately 35 minutes can go or return to either of the Airport Terminals (T1 or T2) comfortably and economically, without having to change stations or stops. The route covers strategic stops in the city. All of our vehicles are adapted for people with mobility problems, they have a large area for luggage and all the commodities offered by good public transport. 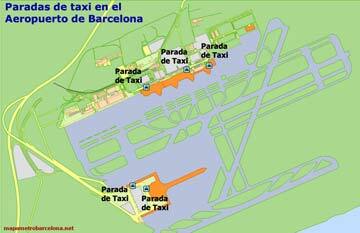 Timetables A1 (Aerobus 1), Monday to Saturday, 05.30 h to 00.30 h, from Pl. 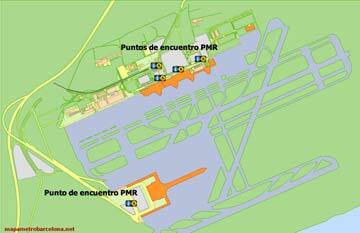 Catalunya (Barcelona) to Terminal T1 (Airport) and 06:10h to 01:05h from Terminal T1 (Airport) to Pl. Catalunya (Barcelona). 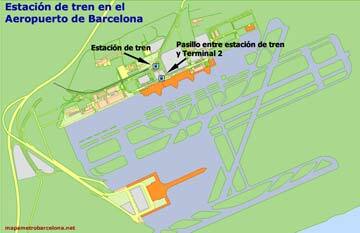 Timetables A2 (Aerobus 2), Monday to Saturday, 05.30 h to 00.30 h, from Pl. 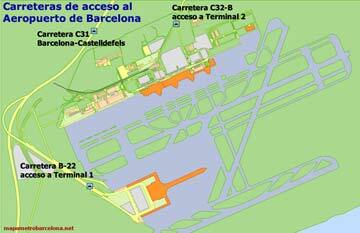 Catalunya (Barcelona) to Terminal T2 (Airport) and 06:00h to 01:00h from Terminal T2 (Airport) to Pl. Catalunya (Barcelona). Fares of Aerobus tickets: You can buy your ticket from the staff at the bus stops (payment in cash or by credit card), at the automatic sales machines (payment by credit card) or by paying the bus driver (cash only payments). Single ticket: 5.90 €, valid for one person and his/her luggage and valid up to one hour after purchasing. Return ticket: 10.20 €, valid for person and his/her luggage. Valid GOING up to 1 hour after purchasing, and valid RETURN up to 9 days after purchasing. You must keep the ticket in order to exchange it for the return ticket trip. For more information, you can visit Aerobus website: www.aerobusbcn.com. If you find any fault or want any changes on this page, send us a message explaining the fault and we will fix it. 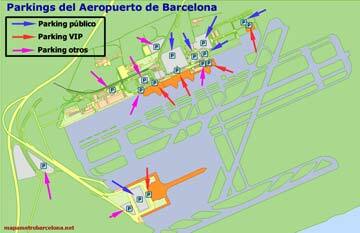 Thank you very much for your visit, we hope that was helpful our Barcelona Airport map and others little maps.